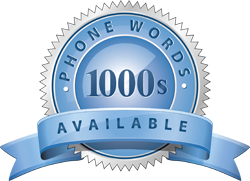 There are a number of factors that influence the value of each Phone Word asset. In general, the better the quality, the more valuable the Phone Word. Depending on your advertising budget and how much business you receive through word of mouth will often give you an indication of the value of the Phone Word for your particular business. It is often said that a Phone Word is the perfect marriage to word of mouth marketing. Typically the more you spend on advertising, the stronger your conversion rates, the greater the impact your Phone Word will have.